Back Chat: Vienna, Fabulous City of Music, Where Even The Horses Dance. Vienna, Fabulous City of Music, Where Even The Horses Dance. Eugene and I were in Vienna for three whole days, so much to do in so short a time. Let Back Chat guide you through the fabulous city of music where even the horses dance. We were first aware of gentle background music on our arrival at Schwechat, Vienna International airport. Once in the taxi, we heard the delicate strains of Mozart. No pumping rock band, but instead, glorious music. The taxi driver, whose knowledge of music was considerable, was only too delighted to share that knowledge with us. We floated, relaxed and untrammelled, to our beautiful hotel, The Bristol, one of the great hotels of Vienna, situated next to the Vienna State Opera house within the Inner City. This is where Society met around 1880 between the Schwarzenbergplatz and the Opera House for gentle walks or at the Korso, which was the popular Open-air Reception Area of the Circular Road, the Ringstrasse. At the Bristol, where fin-de-siecle antiques blended harmoniously with modern technology, we were greeted by soft music, Mahler perhaps? Vienna for 3 whole days, so much to do in so short a time. Where to begin? Make friends with the Concierge! He can be most useful in giving directions, making suggestion about where to go or perhaps acquiring tickets for events. At the turn of the century a trader, Auguste Sirk, rented a shop at the corner of Kartner Strasse and Karntnerring. He sold elegant travel accessories and soon the practical Viennese named the corner Sirk Corner. It became a popular rendezvous. It has an entrance from within the hotel that saves you from the rigors of the very cold night. Directly off the street, there is the Café Sirk, serving delicious Viennese cakes and coffee, late breakfasts and light meals from 10am to midnight. There is a staircase that leads to the Mezzanine level and the Restaurant Sirk. The Viennese are renowned for their superb soups. Full bodied beef consommé with semolina dumplings light as a feather or a consommé with sliced pancakes. Enjoy a roast breast of chicken in a lemon sauce on a polenta base or you could choose from a luscious buffet. Delicate Petit Fours were served with the coffee, including one, which was a miniature Imperial Torte. There is a story that a young apprentice chef created the Imperial Cake for Emperor Franz Josef. Of course the recipe is secret, but you can taste milk chocolate blending sweetly with a stronger almond flavour, then the exquisite taste of marzipan, which ultimately gives way to a slight hint of cocoa on the palate. A symphony of tastes as sweet as the music that rose and fell in the background. The restaurant has a wonderful view of the Vienna State Opera. We were entranced by the elegance of the people who wandered for a late supper where they were warmly greeted with the familiarity of frequency. The restaurant has 4 smallish inter- leading rooms where you share tables and the busy patron seems to squeeze everybody in. Try spinach on rosti topped with a poached egg, divine. Deer sausage, red cabbage and potatoes washed down with a pils beer were ideal for the cold weather. The restaurant sports a wonderful trompe d’oeil painting of a cat sipping beer from a full beer mug. We took a photograph that when developed, appeared as a window with the cat in the forefront. Again, above the bustle and noise, we heard beautiful music and it made us smile. In Vienna, the coffee culture is strong, and there are many historical coffee houses that compete for custom. Demels is one of the oldest and most famous for its confectionary. The atmosphere is busy and warm, but completely orderly. Everything at Demels is made in house, even their own chocolate. Each of the pastry cooks is a specialist. Its story begins in 1786 when Ludwig Dehme opened his Court Theatre Confectionery on St. Michaels Square. 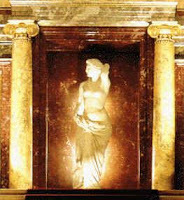 Within a short time, Dehmes was considered chic by the Viennese society. 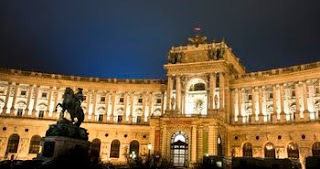 Dehme’s delicacies were delivered to Emperor Franz Josef 1st at the Hofburg Palace. The famous confectionery acquired the name Demels when the eldest son of the founder passed on the ownership to his apprentice, Christoph Demel. It remained in the Demel family and in honour of their father; they renamed it ‘Imperial and Royal Court Confectionery CH DEMEL’S SONS’. A son, Carl, took over the confectionery in 1911 and was greatly assisted by his sister-in-law Anna Demel. Among all Demel’s famous pastries is their ‘other-worldly’ custard slice, heavenly smooth custard was encased in a light, melt-in-the mouth pastry. Order filter coffee served with milk or whipped cream. What a treat! The golden epoch, for which Vienna is so famous, began around 1600 and lasted until the end of the 18th century. It was an age of exuberance. Great baroque palaces, churches and monuments dominated Vienna’s architecture and still do. The Baroque turned into a way of life because it appealed to the Viennese’s love of beauty and sensuality, to their infatuation with music, drama and feasting. Their appetites were enormous and as a rule at least eight huge courses were served at banquets. Early in the 19th century, the Baroque gave way to the Biedermeyer period of relaxed living. A visit to the Grand Hotel Imperial, sister hotel of the Bristol, is a must, encapsulating the atmosphere of this enchanted city. It was rapidly approaching dusk as we entered, greeted by the joyous strains of Strauss. Magnificent chandeliers sparkled and shimmered from huge stucco ceilings providing brilliant light, causing us to forget the encroaching darkness outside. The foyer of the Imperial is very grand and very large with Winterhalter’s famous portrait of Empress Elizabeth of Austria in cream and gold. The exquisitely beautiful, graceful and complex Empress was affectionately known as ‘Sisi’. These sumptuous surroundings were originally created in 1863 as the Vienna residence of Prince Wurttenberg. The stately palace was transformed into the Hotel Imperial for the World Fair in 1873. 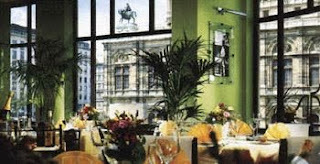 Dine at the famous Korso Restaurant, The KORSO bei der OPER, on the ground floor of the Bristol. This fin de siecle restaurant is internationally ranked. The restaurant has a reputation for combining the Viennese flair and tradition with carefully selected food and exceptional service in a unique setting. The dress code was jackets, but not necessarily ties, and yet one felt happy to dress up to honour this elegant establishment. The Maitre d’, dressed majestically in tails, greeted us and showed us to our table. Music. Gently in the background, a pianist played heavenly music. We were transported to an era of long ago. The Chef de Cuisine is Richard Greer. He has earned a Michelin star and 3 Toques in Gault Millau and was named Chef of the year in 1993. First an amuse gueule was served with beautifully baked bread. The amuse was bone marrow, wrapped in phyllo pastry. The consommé was heavenly. Reduced, yet allowing the taste of beef to protrude, beautifully subtle, not too heavy and overpowering. The dumplings were delicate, and all we had ever dreamed they could be. The rack of lamb was pink and crisp, with not an ounce of gratuitous fat. Succulent vegetables were served separately. Dessert, sweet berries combined with summer fruits. (Summer fruits in the heart of winter? It remains a mystery) Two scoops of wonderful sorbet, mango and lemon added a refreshing note. The service in Vienna is super-efficient, unobtrusive and never at any time did we feet hurried or harried. The pianist played on, and quite spontaneously some dinner guests got up and danced in the small space around the piano. We joined them, swept away by the music of Vienna. On leaving the restaurant, the Bristol Bar beckoned. One of the traditional meeting places for fashionable society where you can enjoy a nightcap while drinking in the ambience. Vienna is the home of the Spanish Riding School. The horses only perform on a Sunday in winter but practice every morning. The public is permitted, at a price, to watch the practice sessions. What a joy to watch these magnificent stallions put through their paces. The Lipizzaner is the oldest breed of horse that is bred in Europe. The origins of the Spanish Riding School are obscure, but it is believed to have been founded in 1572. By breeding and training horses from Spain, the Hapsburgs formed the School to cultivate the classic skills of horsemanship. The horses are born black or brown and become their wonderful colour of white or off-white, as they grow older. They perform ballet-like steps, with wonderful names such as pirouette, levade, courbette, capriole and many others. They lift their strong legs almost daintily in time to the music in the background. 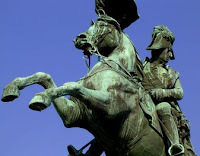 The instructions from the riders are invisible, and horse and rider are at one with each other. The horses appear consumed by the music as they move in mysterious time to the beat, and dance with joy tossing their heads and marvellous manes. An equine ballet that is amazing to behold. After lunch it was onto the magnificent Schonbrunn Castle, which takes its name from a beautiful spring that was found on the site. Schonbrunn was the summer palace and the refuge of the Imperial Family. The palace is set in glorious gardens created in the French style, with many famous fountains and sculptures adorning the pathways and floral displays. The fascination of the palace lies not only in the political and historical events which took place at Schonbrunn, but also in its family intimacy; Empress Maria Theresia (1740 – 80), who loved Schonbrunn was instrumental in the restoration of the palace and turning it into a summer residence. It was here that the little Mozart hopped onto her lap after his recital. It has a long and turbulent history and the splendour of Imperial times gone by is represented by the Wagenburg, a large collection of state and custom carriages that demonstrate in particular the vehicles in use by the Viennese Court between 1690 and 1918. Walking through the rooms of the castle, one experiences a sensation of being transported to a fairy kingdom. Modern technology intrudes, as there are earphones to charm you with the rich history of Schonbrunn as you journey through the amazing rooms. A room that especially intrigued was the Marie Antoinette Room. Archduchess Maria Antonia, daughter of Maria Theresia and her husband Franz 1 Stephan, was married to the dauphin of France, the later king Louis XV1. From then she bore the name Marie Antoinette. Her tragic destiny was fulfilled on 16 October1793, when she was executed nine months after her husband in the post revolutionary chaos in Paris. The walls of the room show a dull white wood panelling with rich gold leaf decoration. The furniture seemed to have a French feel and one of the paintings is a grand rendering of ‘Archduchess Marie Antoinette’ by Amerling. There are portraits of other Royals of the period by the same artist. High ceilings and elaborate cornices add to the presentation of a fascinating room that echoes a desperately sad history. Walk slowly through graciously decorated rooms with Gobelin tapestries, and grandiose pictures in elaborate frames. The furniture, all exquisitely crafted, created an atmosphere of great luxury. In the Gobelin Salon, Brussels Gobelin tapestries refer to the 12 months of the year. A beautiful structure, the Gloriette, stands on the hill behind the palace, crowning the complex of Schonbrunn. It was erected in 1775 and is adorned with sculptures. An irrigation problem of the gardens was solved by the creation of two Gloriette ponds. The gardens provide many delights, including a zoological garden and a palm hothouse. Roman ruins and Neptune’s fountain are also treasures to be explored in the magical gardens. Until her death in 1780, the building and shaping of Schonbrunn Palace had always been of great concern to Marie Theresia. It is to her credit that Schonbrunn became a testimonial to Austria’s great imperial era. Many great political and historical events are associated with Schonbrunn. Napoleon lived there for a brief time, and his son grew up there. Sadly the young boy spent a short and lonely life there, dying of consumption at barely 21 years old. Emperor Franz Joseph 1 made Schonbrunn a refuge and workplace. He too became increasingly lonely and died in the middle of World War 1 in1916 after a reign of 68 years. His successor Karl 1 abdicated in Schonbrunn in 1918 and took refuge on the exquisite island of Madeira. Then it was on to Café Mozart for coffee and pastries which shapes the particular special glory of Austrian cooking. 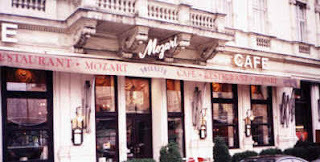 The Café Mozart is the coffee and pastry house of the great Sachar Hotel. The atmosphere is warm and cosy and you are positively riveted by the huge amounts of torte being consumed! The cafe latte is a decadent delight. We shared what was probably the finest apfelstrudel we had ever eaten, filled to bursting with delicately spiced apples. There is a sacred ritual about making the dough for the Apfelstrudel. It is said that you must be able to read your newspaper through the strudel dough, which should be as thin as an onionskin. The process is taken very very seriously and the result, perfection. The Café Mozart opens onto the street and in summer it must be glorious to sit there and watch the Viennese go about their lives. The Viennese devotion to all things sweet is unrivalled. Their enjoyment of cakes and pastries evokes for them almost as much pleasure as their love of music. Every Viennese has a konditorei without which life would not be worth living! Every confectioner and baker still hopes to become renowned for some confectionary he has himself devised. The special glory of Austrian cooking reveals itself in the sweets. Of all these noble creations, the Sacher Torte are probably the most talked about worldwide. This torte was the cause of the seven year sweet war between Sachers and Demels! Sachers won but the controversy continues as to which the most delicious version is. The Sacher torte is a rich round chocolate sponge cake that is filled or coated with apricot jam. Some Zucker- Backers do both. This torte was created in 1832 by a baker named Franz Sacher to please the sweet the sweet tooth of the renowned statesman Prince Klemens von Metternich. The son of Franz Sacher founded the Hotel Sacher in 1876. It became famous for the romantic liaisons of the rich and noble and is still a discreetly sumptuous hotel. The Café Mozart is usually full of tourists, thanks to this eponymous chocolate cake. Even the best efforts of the friendly and helpful concierge could not procure tickets for the opera, so we settled for a guided tour of the Opera House. Much of the original Opera House was bombed in World War 2, a fact that was often repeated by the docent. 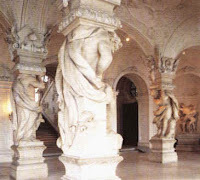 The main staircase is original, as is the Schwind foyer and the Tea House of Franz Josef 1. This is a charming room outside his private box where he entertained his friends and the many dignitaries he had invited to join him. One can visualise scenes of men in full evening dress, sometimes uniforms, and ladies in marvellous evening regalia. Gustav Mahler was the director of the Vienna Opera for 10 years. The Vienna Opera House is one of the greatest in the world. The acoustics are excellent and the world famous conductor Arturo Toscanini advised on the rebuilding of the theatre. Seats are sold one week in advance. Standing room tickets are on sale one hour before the performance starts. Ticket touts have no success here, though it is not for lack of trying. Tickets have to be bought at the Opera House or authorised agents. Touts, dressed in eye-catching black coats, sell tickets outside the Opera House. Unfortunate buyers of these tickets find them to be invalid and are refused entry. The Great Hall where the operas are staged is very grand with private boxes around the circumference. Die Fledermaus is always performed at New Year, with famous guest artistes making surprise appearances. Ballets are also staged, and the night after we left, they were performing Giselle. How we would have loved to watch a ballet in that wonderful atmosphere. Onwards. After a quick lunch at the Konigsbacher, which is so conveniently situated near the Opera House, we took a taxi to the Sigmund Freud Museum. It is a fascinating experience wandering through the Freud family’s living space and seeing his offices and the tools of his trade. There is an iron couch where his patients lay and unfolded their dreams to him. It looked very uncomfortable and one imagines the dreams were very tormented. Freud established his medical practice at Berggasse 19 and worked there until he was driven into exile in England. The adaptation of Freud’s house and office as we see it today was carried out in several steps. At its opening in 1971, the museum was initially limited to the few rooms of the former office. Freud never owned the house and always rented it. In the 80’s, the Sigmund Freud society was given charge of the entire apartment that Freud rented until 1938. Decoration and remodelling was undertaken. The Sigmund Freud Society’s scientific library derives from an initiative taken by his daughter Anna Freud, who carried on his work. We could not dally as long as we would have wished. Onto the magnificent Belvedere Palace. . The taxi driver would have made an excellent guide. Johan Lukas von Hildebrandt, who also designed the Schonbrunn Palace, built the Belvedere Palace as the summer residence of Prince Eugene of Savoy. The Belvedere consists of two palaces linked by a formal garden laid out in the French style by Dominique Girard. The gardens are breathtakingly beautiful and the art superb. An exhibition of the works of Gustav Klimt, one of Austria’s most illustrious artists, had just finished, but the museum has 3 permanent examples. Arguably his most famous painting, the Kiss, is on permanent show. It is a joy to behold. An art teacher was lecturing her class on the intriguing and incredibly fine decorative aspects of this work and I watched the young faces glow with wonderment. We wandered through rooms depicting works by Andy Warhol, Claus Oldenburg, Jim Dine and many many more. Some wonderful examples of Dutch work with vibrant Van Goghs; Belgian work by Fernand Khnopff and German Impressionists represented by Louis Corinth and Max Lieberman were on display. We saw glittering examples of the work of Monet, Manet, Camille Pissarro and Auguste Renoir, what a feast! There were two pieces or perhaps one might say arrangements that intrigued me. One was a white chess set crafted by Yoko Ono, set on a white chair and table on a raised white platform. The other a wonderful work by Jackson Pollock. All these treasures are in the Upper Belvedere Palace. A beautiful baroque gate fronts the Palace with an S for Savoy integrated into the Cross of Savoy. The façade of the pavilions resemble the shape of Turkish tents – an allusion to Prince Eugene’s victories over the Turks. The Museum of Austrian Baroque is housed in the elegant rooms of the Lower Belvedere. There is the astonishing Hall of Mirrors. This gets its name from the display of huge gilt mirrors that cover the walls. The Hall of Grotesques displays paintings of Grotesques inspired by ancient Roman frescoes. Music, a last divine dinner at the Restaurant Korso, a glass of champagne in the Bristol Bar and a toast to a wonderful interlude in Vienna. The Vienna Woods, the lilting Danube, so many more palaces and museums, beautiful churches, architecture and coffee houses remained as promises for a next visit. Always look for deals on the Internet. We were delighted to find that in low season, a stay of 4 nights at the Bristol, allowed a night free, thus only paying for 3 nights. Make friends with the Concierge! He can be most useful in giving directions, making suggestions about where to go or perhaps acquiring tickets for events. Taxis are easily found in Vienna. It is swifter to get a taxi at one of the city’ ranks, than hailing one in the streets. There is also an excellent underground system called the U-Bahn, and a tram system. One can walk to most places, but because it was winter and cold, we settled for taxis, which were usually large saloon cars and spotlessly kept. The efficiency of the Viennese was emphasised, when on our final morning, as pre-arranged on our arrival, the taxi driver was waiting for us in the foyer of the hotel at the agreed time. Beautiful music in the taxi, something we had come to expect and to look forward to. How we would miss the aura of music that pervades the city.